One of the main challenges of European HPC today is that Europe does not produce some of the key technologies for HPC, and particularly processors. Being able to design HPC systems based on home-grown technologies is critical for Europe’s strategic self-reliance, as well as for the robustness of European industry and of the European job market. The newly-created EuroHPC addresses this issue, promoting the development of European technology for the Exascale. As part of this, the European Processor Initiative (EPI) ambitions to deliver an indigenous HPC processor, as well as an embedded processor for automotive and other AI applications by 2025. Mont-Blanc 2020 is upstream of EPI. 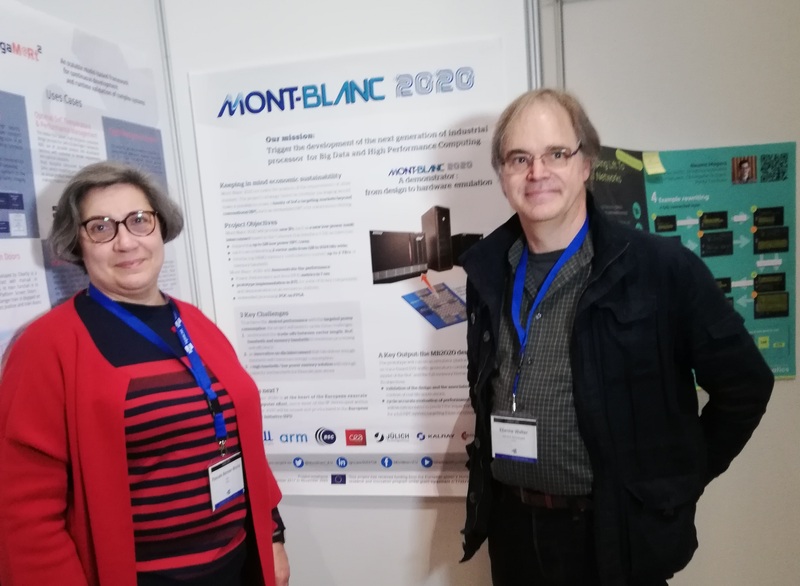 The objective of Mont-Blanc 2020 is to start developing building blocks (IPs) for an HPC processor. The team will design and demonstrate ASIC modules, and this IP will be reused and productized within EPI. In that sense, EPI will rely on the work done in the Mont-Blanc 2020 project. The EPI initiative is part of a broader strategy to develop an independent European HPC industry based on domestic and innovative technologies as presented in the EuroHPC Joint Undertaking created at the initiative of the European Commission. The general objective of the European Processor Initiative (EPI) is to design a roadmap for future European low power processors for extreme scale computing (exascale), high-performance, big-data and emerging applications (e.g. automotive computing) and other fields that require highly efficient computing infrastructure. Ensuring that the application areas of the technology are not limited only to HPC, but cover other areas, such as automotive and data centres, thus ensuring the economic viability of the initiative. EPI gathers together 23 partners from 10 European countries with a wide range of expertise and background: HPC, supercomputing centres, automotive computing, including researchers and key industrial players. The fact that the envisioned European processor is planned to be based on already existing tools either owned by the partners or being offered as open-source with a large community of users, provides two key exploitation advantages: (1) the time-to-market will be reduced as most of these tools are already used in industry and well known. (2) It will enable EPI partners to incorporate the results into their commercial portfolio or in their scientific roadmap. EPI covers the complete range of expertise, skills, and competencies needed to design and execute a sustainable roadmap for research and innovation in processor and computing technology, fostering future exascale HPC and emerging applications, including Big Data, and automotive computing for autonomous vehicles. Development of a new processor to be at the core of future computing systems will be divided into several streams. First stream is focused on a general, HPC processor chip. This generation is aiming to go into pre-exascale machines with industry proven technologies. Second stream focuses on accelerator chips and systems with the RISC-V architecture as the enabling component for exascale, low-power computing systems. The results from two streams will generate a heterogeneous, energy-efficient CPU for use in both standard and non-traditional and compute-intensive segments, e.g. automotive where SoA in autonomous driving requires significant computational resources. EPI strives to maximize the synergies between the two streams and will work with existing EU initiatives on technology, infrastructure and applications, to position Europe as a world leader in HPC and emerging markets for exascale era such as automotive computing for autonomous driving.